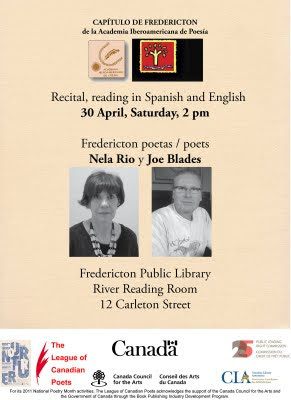 The Fredericton Chapter of the Iberoamerican Academy of Poetry and the League of Canadian Poets invite you to a Poetry Recital in Spanish and English by Fredericton Poets Nela Rio and Joe Blades on Saturday, April 30th at 2 pm at the River Reading Room in the Fredericton Public Library, 12 Carleton St., Fredericton. Both poets will be reading from recent publications and new materials. Nela Rio has recently been nominated for the League of Canadian Poets’ Pat Lowther Memorial Award. She recently launched her collection of poetry, La Luna, Tango, siempre la luna /The Moon, Tango, Always the Moon (Broken Jaw Press, 2010). Blades’ most recent work published is Prison Songs and Storefront Poetry (Ekstasis Editions, 2010). He is an active member of the local BlackTop MotorCycle Gang writers’ group, coordinator of the Fredericton Small Press & Community Fair, and President of the League of Canadian Poets. This event is held in conjunction with the 2011 National Poetry Month. For its 2011 National Poetry Month activities, The League of Canadian Poets acknowledges the support of the Canada Council for the Arts and the Government of Canada through the Book Publishing Industry Development Program. Other sponsors include the Public Lending Right Commission, the Government of Canada, and the Canadian Library Association. Please join us for what promises to be an exceptional reading! 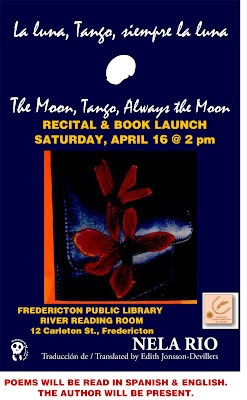 Fredericton poet and artist Nela Rio will launch her book, La luna, Tango, siempre la luna/The Moon, Tango, Always the Moon on Saturday April 16, 2011 at 2 pm, at the Fredericton Public Library’s beautiful River Reading Area (upstairs), 12 Carleton Street, Fredericton. The Fredericton Chapter of the Ibero-American Academy of Poetry is hosting the event. The book, published by Broken Jaw Press in 2010 has been translated from the Spanish by translator Edith Jonsson-Devillers and includes a prologue by Governor General’s Literary Award winner, poet and translator, Hugh Hazelton. This collection has been short-listed for the League of Canadian Poet’s prestigious Pat Lowther Memorial Award, a prize given for a book of poetry by a Canadian woman published in the preceding year in memory of the late writer whose career was cut short by her untimely death. The judges commented: “Foreign accents, mystery, intrigue, sensuousness, all culminate in the dance that steps over, around, and through the mundane and lifts its skirts to new heights and wishes.” Please join us for a rare opportunity to discover one of Fredericton’s most talented writers. There will be a brief presentation of the book, followed by a bilingual reading of selected poems from the collection. La poeta y artista de Fredericton, Nela Rio, lanzará su último libro, La luna, Tango, siempre la luna/The Moon, Tango, Always the Moon el sábado 16 de abril a las dos de la tarde en la Biblioteca Pública de Fredericton (en la linda sala River Reading Area), 12 calle Carleton, Fredericton. El capítulo de Fredericton de la Academia Iberoamericana de Poesía es huésped del evento. El libro, publicado en el año 2010 por la casa editorial Broken Jaw Press, fue traducido por la traductora Edith Jonsson-Devillers e incluye un prólogo por Hugh Hazelton, poeta y traductor premiado por Governor General’s Medal. El libro de poesía de Rio ha sido seleccionado en la lista corta del prestigioso premio Pat Lowther Memorial, de la Liga de Poetas Canadienses, un premio que galardona a una poeta publicada en el año anterior, en nombre de una poeta que falleció siendo joven y al principio de su carrera. Los miembros del jurado comentaron: “Acentos del extranjero, misterio, intriga, sensualidad, todo culmina en el baile que da paso, da vueltas y traspasa la rutina y levanta sus volantes hacia nuevas cumbres y deseos.” Están invitados a reunirse con nosotros para esta rara oportunidad de (re)descubrir una de las escritoras más talentosas de Fredericton. Habrá una breve introducción del libro, seguido por un recital bilingüe de poemas seleccionados del libro. ¡No se lo pierda!